LG’s Knock-ON UX will now be a standard feature on its L Series II devices. The UX turns the whole screen into a power button, by double-tapping the screen, the user can now lock and unlock the device. Knock-ON rolls out as an update refresh to LG smarphones this February after its original inclusion in the LG G and G2 devices which had the power button located on the back of the phone. “There’s an increasing emotional connection to technology. This is why LG is expanding its Knock-ON UX features to the L Series II devices. Users can just Knock on the screen to switch on the LG device.” – Joseph Kim, MD, LG Kenya. LG G2 was introduced in August last year as an Android 4.2.2 device with features which included Answer Me – which answers the phone when its raised to the year, Quick Remote – turning the device into a remote control for home entertainment devices and Guest Mode – for multi-user support on a single phone. The Knock-ON UX included with the G2 was positively received by consumers prompting its expansion to the L1 II, L3 II, L4 II, L5 II and L7 II. 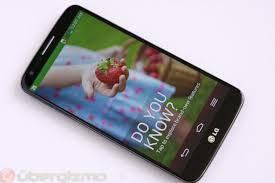 “Knock-ON is patented by LG and its our killer feature in the G2. You can update it through firmware over the air or you can go to the LG site and download it from there.” – Joseph Gachanja, Sales and Marketing manager, LG Kenya. The mobile vendor has also introducing LG G Pro lite which comes with 5.5″ IPS screen and capitalizes on market demand for smartphone apps. It has a stylus pen for increased productivity and creativity. The phone comes pre-loaded with BBM for messaging. G Pro Lite has an impressive rear camera with 8 MP BSI (Back Side Illumination), dual speakers with 1.4 amp high boost amp, long-lasting 3140 mAh Battery, and it includes QuickMemo which allows you to write notes directly over your images. Guest Mode introduced in the G2 for multi-user support is also present in the new device, this is one feature that would allow the device to be used by friends or a family member without worrying about your data. Video recording on the G Pro Lite has pause/resume features allowing amateurs to create videos from different locations on the same reel. Knock-ON will be rolled out as firmware over the air (FOtA) update. The G Pro Lite is expected to be available by the end of February at KES 33,000/= and LG will be offering a warranty of 2 years for the device.